Edge.org  was launched in 1996 as the online version of "The Reality Club" and as a living document on the Web to display the activities of "The Third Culture." The Reality Club was an informal gathering of intellectuals who met from 1981 to 1996 in Chinese restaurants, artist lofts, investment banking firms, ballrooms, museums, living rooms and elsewhere. Reality Club members presented their work with the understanding that they will be challenged. The hallmark of The Reality club has been rigorous and sometimes impolite (but not ad hominem) discourse. The motto of the Club was inspired by the late artist-philosopher James Lee Byars : "To arrive at the edge of the world's knowledge, seek out the most complex and sophisticated minds, put them in a room together, and have them ask each other the questions they are asking themselves." As James Lee said: "To accomplish the extraordinary, you must seek extraordinary people." At the centre of every Edge project are remarkable people and remarkable minds— scientists, artists, philosophers, technologists and entrepreneurs who are at the center of today's intellectual, technological, and scientific landscape. They are representative of The Third Culture I wrote about in "The Emerging Third Culture ," a 1991 essay, and a book, The Third Culture: Beyond the Scientific Revolution , published in 1995. In the words of the novelist Ian McEwan , edge.org is "open-minded, free-ranging, intellectually playful… an unadorned pleasure in curiosity, a collective expression of wonder at the living and inanimate world… an ongoing and thrilling colloquium." 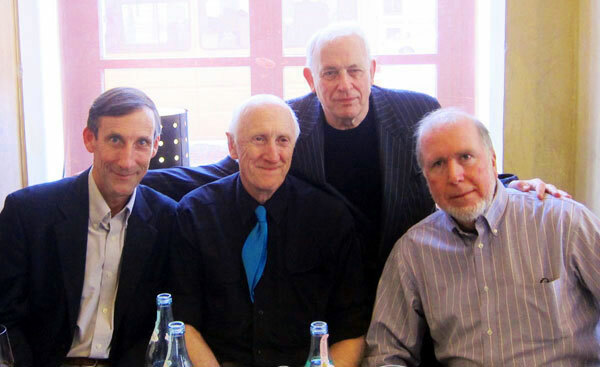 Stewart Brand  is the founder and editor of Whole Earth Catalog and author of Whole Earth Discipline; Kevin Kelly  helped to launch Wired in 1993 and is the author of Out of Control and What Technology Wants; and George Dyson , a science historian, is the author of Darwin Among the Machines and Turing's Cathedral. This year, Laurie Santos , Associate Prefessor of Psychology, and Director of the Comparative Cognition Library at Yale, became involved, adding to the mix her keen intellect as well as a wide range of contacts among the leading thinkers of her generation. This was the case with research psychologist Steven Pinker's  2012 question: "What Is Your Favorite Deep, Elegant, Or Beautiful Explanation? ",  and with theoretical psychologist Nicholas Humphrey's  2005 question "What Do You Believe Is True Even Though You Cannot Prove It?" ,   which earned him the title of "Edge Question Laureate", and about which BBC4 Radio noted: "Fantastically stimulating...It's like the crack cocaine of the thinking world.... Once you start, you can't stop thinking about that question." The online publication of the annual question occurs in mid-January, and in recent years it is followed in a little more than a year by a printed book. Last year we worried about worrying by asking"What Should We Be Worried About?" . This year's question comes out of "HeadCon 13" What's New In Social Science" , a two-day Edge seminar that took place in September last year. At one point, psychologist Laurie Santos  mentioned to the group that she was interested in why there was no mechanism in social science for retiring ideas in order to make room for new initiatives.